Do you use Windows keyboard settings designed to accommodate disabilities? There are three excellent settings that can make your life easier: Sticky keys, Filter keys and Toggle keys. 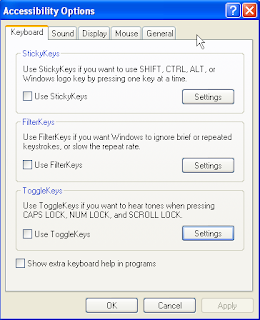 Sticky keys: When turned on, Sticky keys allows you to press keys simultaneously which would normally take two hands, and it still lets you close the window. For example, it lets you hold down the CTRL key first and then ALT and then DEL and the computer will "hold" all three down in succession for you. Filter keys: This control allows users with tremors or accidental extra keystrokes type without the keyboard picking up the second hit. If you struggle with banging extra keys or hitting one multiple times, this should help. 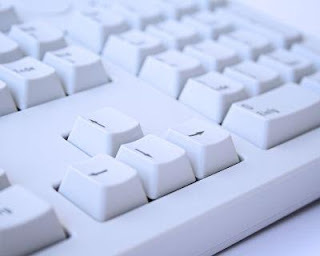 Toggle keys: For folks with visual impairments, when Toggle keys is on, a specific tone is played when CAPS, CAPS LOCK, NUMBER LOCK or SCROLL LOCK are on. How do I access these features? First, go to your Start button in Win XP. Then choose settings/control panel/accessibility options. Click on the keyboard tab and then check the boxes for each feature you want to enable. There is a settings button for each one that give you more options as far as shortcut key assignments that turn these features on/off and some preferences. When done, click OK. If you have further issues with keyboarding, there are other options in the way of a "soft or virtual keyboard". Windows has their on-screen keyboard (link to MS tutorials) and there is also an excellent one called Click-n-type you can download for free. It also has a free word prediction add-on you can download too. If you are ready to throw a keyboard out the window, you can use a mouse or a track-pad to type on the screen without touching a keyboard at all. 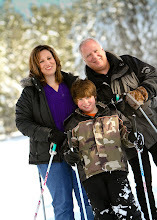 This blog is for posts and comments on children, disabilities, assistive technology and education. Please share your thoughts, questions and opinions. They are welcome! I am an educator and an assistive technology specialist and trainer. I combine success principles and motivational methods with goal setting, planning and assistive technology to help people overcome barriers. This is a main passion. I also have a background in Christian ministries and graduated from George Fox College. I served with Youth With a Mission and was a keyboardist playing with Maranatha artists, Integrity Hosanna, Hillsong, Last Days Ministries and Jimmy and Carol Owens. My wife and I run a retreat center in Eastern Oregon. All the best to you! AT Gift Idea List: Send me Your Ideas! Contest for Free AT Software Starts Today! The call is out monthly for all bloggers as contributors. Open topic of your choice. When you submit, you get new visitors, more traffic and we get your great information! Hear my latest podcast automatically. Select "posts" button to choose from a playlist. Subscribe on "get podcast" button or subscribe underneath. Use the subscribe above or go to the bottom of this blog and click the Subscribe: Posts (atom) link .When you subscribe, you can view my posts from your Favorites links in your web browser. There should be a "feeds" choice with the orange RSS symbol. Email me if you have problems. You can subscribe to an audio-enriched RSS feed powered by Odiogo here: Audio -enriched RSS feed. You can download Mp3 files of my blog posts on this link too. Disclaimer: Assistive Technology Information is not the same as contracted assistive technology services. This blog is for information only. Any individual reading this information should check with their local physician or therapist before trying any device or therapy described herein. The author will not be held responsible for any injury or loss if it should occur from unsupervised or unauthorized use of equipment or information posted on this site.